Fitness First Outdoor Fitness is your complete outdoor training program. It's fun, exciting and highly motivating, incorporating the best elements of training - all in the great outdoors. Outdoor Fitness will take your results to the next level with a new program that includes a greater variety of equipment, unique exercises, activities and programming catering to a wide range of participants - from people who are just starting out to those who already have a solid fitness base - and you don't even have to be a Fitness First member to participate. 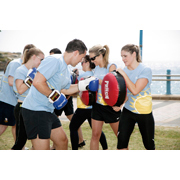 Fitness First Outdoor Fitness has over 30 training locations nationally. We have programs running in the best outdoor training locations our major cities have to offer. The Fitness First Outdoor program kicks off at 6.00am (the best time of the day!) and runs for one hour, three times a week, for four weeks. The first Outdoor programs start this February, so you'll have to hurry and sign up now as places are filling quickly. We'll also be running further Outdoor programs throughout the year so click the 'Make Enquiry' link if you would like to find out when the next program starts. The physical benefits include, increased fitness levels, reduced body fat and increased muscle tone. You'll sleep better, have more energy and you'll be on the path to living a healthier lifestyle. Outdoor is a great way to kick start your fitness regime or supplement your current training. How do I join Fitness First Outdoor Fitness? Everyone is welcome to join Fitness First Outdoor- you don't even have to be a Fitness First Member. Click the 'Make Enquiry' link on the page of the closest location to you (locations listed below)to contact us. We'll be able to give you further information about Outdoor Fitness and discuss how you will specifically benefit from participating in the Outdoor program. Depending on where you live or work, there will be a Fitness First Boot Camp course convenient for you, choose from the locations listed below.